I have a thing with gardening, an obsession really. I would not quite call it Tulip Mania, but it’s bad, and now I have one more obsession to boot. The Antoinette tulip is multiflowering, which essentially means its hues change over the bloom period, and it is gorgeous. Antoinette would have been a fan simply for the tulip’s whimsical nature. It’s Easter yellow and green . . . no, wait, raspberry pink. No, salmony orange. Oh, dear. 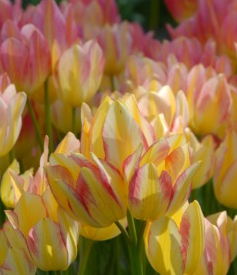 As a bouquet tulip, Antoinette is also abundant, producing 4-6 flowers per bulb. The name really is perfect and although spring seems an awfully long way off, any Antoinette fan would be remiss to not have some of these in her garden.